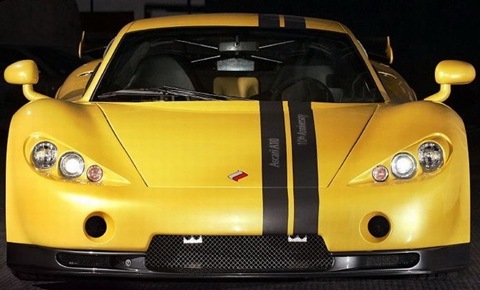 The Ascari Ecosse is a mid-engine sports car produced by Ascari Cars from 1998 to 1999. It was the second production car released by the company and is based on the Ascari FGT.In 1995 Ascari introduced the FGT at various European motor shows,with a design by Lee Noble. It featured a Chevrolet six litre fuel injected V8 engine placed midship behind the driver.At the same time as the launch of the car,Klaas Zwart of the Netherlands chose to enter the FGT in racing,running a Ford V8 engine and entering into the British GT Championship. With the one concept car meeting the homologation requirements,Zwart managed to win an event at Silverstone Circuit in the car's debut season of 1995. The car would also attempt to qualify for the 24 Hours of Le Mans,but would not be fast enough to pass prequalifying. The car continued to maintain pace with newcomers to British GT in 1996,before Zwart would partner with William Hewland,owner of Hewland engineering,for a partial season in 1997 with only a best finish of fourth at Donington Park.Following the 1997 season,Ascari would turn to mass-producing the FGT,making less than 10. Klaas Zwart purchased the company from Lee NobleThe production version of the Ecosse was given a BMW V8 powerplant in place of the Chevrolet and Ford units,although this was further tuned by Hartge. The 4.4 liter engine produced around 300 hp (220 kW),while later larger 4.7 liter units produced around 400 hp (300 kW).The last three cars were produced with the Hartge 5.0 L V8 engine,around 420 hp and 520 nm. The last one was built at Blandford in 2000 with a sequential gearbox and is still in the possession of Ascari. (source Ascari)The spaceframe chassis and wishbone suspension carried a lightweight fibre glass body,weighing in at just 1,250 kg (2,756 lb). The Ecosse,with the larger 4.7 liter engine,was capable of going from zero-to-sixty mph in 4.1 seconds while top speed was achieved at 200 mph (322 km/h). Only 17 examples are known to have been produced,however only nine of these remain today as the other eight have all been destroyed.The Ecosse would eventually be replaced by the Ascari KZ1 in 2003.